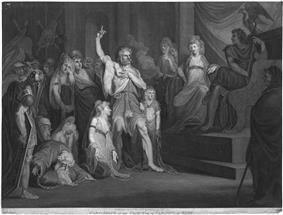 "Caractacus before the Emperor Claudius at Rome", 18th-century print by an unknown artist (British Museum). Caratacus is named by Dio Cassius as a son of the Catuvellaunian king Cunobelinus. 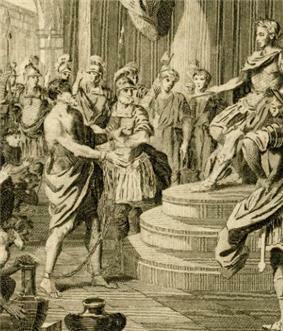 Based on coin distribution Caratacus appears to have been the protégé of his uncle Epaticcus, who expanded Catuvellaunian power westwards into the territory of the Atrebates. After Epaticcus died in about 35 A.D., the Atrebates, under Verica, regained some of their territory, but it appears Caratacus completed the conquest, as Dio tells us Verica was ousted, fled to Rome and appealed to the emperor Claudius for help. This was the excuse used by Claudius to launch his invasion of Britain in the summer of 43 AD. The invasion targetted Caratacus' stronghold of Camulodunon (modern Colchester), previously the seat of his father Cunobelin. Cunobelinus had died some time before the invasion. Caratacus and his brother Togodumnus led the initial defence of the country against Aulus Plautius's four legions, thought to have been around 40,000 men, primarily using guerrilla tactics. They lost much of the south-east after being defeated in two crucial battles, the Battle of the River Medway and River Thames. Togodumnus was killed (although John Hind argues that Dio was mistaken in reporting Togodumnus' death, that he was defeated but survived, and was later appointed by the Romans as a friendly king over a number of territories, becoming the loyal king referred to by Tacitus as Cogidubnus or Togidubnus) and the Catuvellauni's territories were conquered. Their stronghold of Camulodunon was converted into the first Roman colonia in Britain, Colonia Victricensis. We next hear of Caratacus in Tacitus's Annals, leading the Silures and Ordovices of Wales against Plautius' successor as governor, Publius Ostorius Scapula. Finally, in 51, Scapula managed to defeat Caratacus in a set-piece battle somewhere in Ordovician territory (see the Battle of Caer Caradoc), capturing Caratacus' wife and daughter and receiving the surrender of his brothers. Caratacus himself escaped, and fled north to the lands of the Brigantes (modern Yorkshire) where the Brigantian queen, Cartimandua, handed him over to the Romans in chains. This was one of the factors that led to two Brigantian revolts against Cartimandua and her Roman allies, once later in the 50s and once in 69, led by Venutius, who had once been Cartimandua's husband. With the capture of Caratacus, much of southern Britain from the Humber to the Severn was pacified and garrisoned throughout the 50s. [Caratacus] resorted to the ultimate hazard, adopting a place for battle so that entry, exit, everything would be unfavourable to us and for the better to his own men, with steep mountains all around, and, wherever a gentle access was possible, he strewed rocks in front in the manner of a rampart. And in front too there flowed a stream with an unsure ford, and companies of armed men had taken up position along the defences. Although the Severn is visible from British Camp, it is nowhere near it, so this battle must have taken place elsewhere. A number of locations have been suggested, including a site near Brampton Bryan. Bari Jones, in Archaeology Today in 1998, identified Blodwel Rocks at Llanymynech in Powys as representing a close fit with Tacitus' account. If the degree of my nobility and fortune had been matched by moderation in success, I would have come to this City as a friend rather than a captive, nor would you have disdained to receive with a treaty of peace one sprung from brilliant ancestors and commanding a great many nations. But my present lot, disfiguring as it is for me, is magnificent for you. I had horses, men, arms, and wealth: what wonder if I was unwilling to lose them? If you wish to command everyone, does it really follow that everyone should accept your slavery? If I were now being handed over as one who had surrendered immediately, neither my fortune nor your glory would have achieved brilliance. It is also true that in my case any reprisal will be followed by oblivion. On the other hand, if you preserve me safe and sound, I shall be an eternal example of your clemency. He made such an impression that he was pardoned and allowed to live in peace in Rome. After his liberation, according to Dio Cassius, Caratacus was so impressed by the city of Rome that he said "And can you, then, who have got such possessions and so many of them, covet our poor tents?" 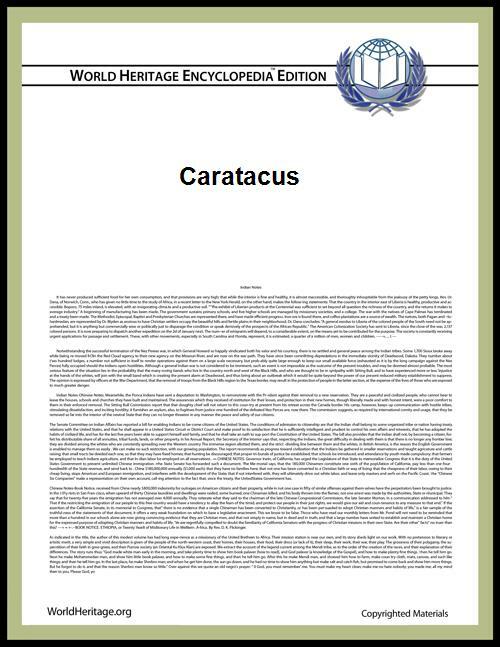 Caratacus' name appears as both Caratacus and Caractacus in manuscripts of Tacitus, and as Καράτακος and Καρτάκης in manuscripts of Dio. 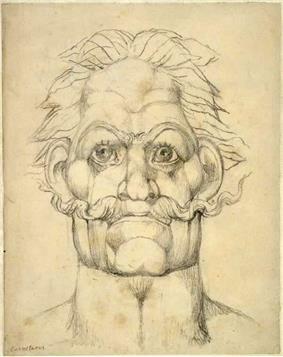 Older reference works tend to favour the spelling "Caractacus", but modern scholars agree, based on historical linguistics and source criticism, that the original Brythonic form was *Caratācos, pronounced , which gives the attested names Caradog in Welsh, Karadeg in Breton and Carthach in Irish. It is is probably cognate to Corocotta, the name of a Cantabrian warrior during the reign of Augustus. Caratacus' memory may have been preserved in medieval Welsh tradition. A genealogy in the Welsh Harleian MS 3859 (ca. 1100) includes the generations "Caratauc map Cinbelin map Teuhant", corresponding, via established processes of language change, to "Caratacus, son of Cunobelinus, son of Tasciovanus", preserving the names of the three historical figures in correct relationship. Caratacus does not appear in Geoffrey of Monmouth's History of the Kings of Britain (1136), although he appears to correspond to Arviragus, the younger son of Kymbelinus, who continues to resist the Roman invasion after the death of his older brother Guiderius. In Welsh versions his name is Gweirydd, son of Cynfelyn, and his brother is called Gwydyr; the name Arviragus is taken from a poem by Juvenal. Caradog, son of Bran, who appears in medieval Welsh literature, has also been identified with Caratacus, although nothing in the medieval legend corresponds except his name. He appears in the Mabinogion as a son of Bran the Blessed, who is left in charge of Britain while his father makes war in Ireland, but is overthrown by Caswallawn (the historical Cassivellaunus, who lived a century earlier than Caratacus). The Welsh Triads agree that he was Bran's son, and name two sons, Cawrdaf and Eudaf. Another tradition, which has remained popular among British Israelites and others, makes Caratacus already a Christian before he came to Rome, Christianity having been brought to Britain by either Joseph of Arimathea or St. Paul, and identifies a number of early Christians as his relatives. One is Pomponia Graecina, wife of Aulus Plautius, the conqueror of Britain, who as Tacitus relates, was accused of following a "foreign superstition", which the tradition considers to be Christianity. Tacitus describes her as the "wife of the Plautius who returned from Britain with an ovation", which led John Lingard (1771–1851) to conclude, in his History and Antiquities of the Anglo-Saxon Church, that she was British; however, this conclusion is a misinterpretation of what Tacitus wrote. An ovation was a military parade in honour of a victorious general, so the person who "returned from Britain with an ovation" is clearly Plautius, not Pomponia. This has not prevented the error being repeated and disseminated widely. Another is Claudia Rufina, a historical British woman known to the poet Martial. Martial describes Claudia's marriage to a man named Pudens, almost certainly Aulus Pudens, an Umbrian centurion and friend of the poet who appears regularly in his Epigrams. It has been argued since the 17th century that this pair may be the same as the Claudia and Pudens mentioned as members of the Roman Christian community in 2 Timothy in the New Testament. Some go further, claiming that Claudia was Caratacus' daughter, and that the historical Pope Linus, who is described as the "brother of Claudia" in an early church document, was Caratacus' son. Pudens is identified with St. Pudens, and it is claimed that the basilica of Santa Pudenziana in Rome, and with which St. Pudens is associated, was once called the Palatium Britannicum and was the home of Caratacus and his family. This theory was popularised in a 1961 book called lost tribes of Israel. Caratacus ('Caratach') is anachronistically depicted as Boudica's general in John Fletcher's play Bonduca (1613). Caratacus is the subject of William Mason's 1759 poem of the same name and the 1776 play based on it. Caractacus [sic] is referenced in a line of the "Modern Major General's Song", the well-known libretto from Gilbert and Sullivan's comic opera The Pirates of Penzance. Caractacus is the title of a cantata by Edward Elgar in 1897-8 devoted to the defeat and capture of the king by the Romans. It was first performed at the Leeds choral festival in 1898. The name Caractacus appears under a poem in The Mysteries of Udolpho by Ann Radcliffe. Caractacus is the subject of a Victorian poem called Caractacus the Briton by William Stewart Ross, published 1881 in a collection titled Lays of Romance and Chivalry, and distinguished by the refrain, "Caractacus the Briton, the bravest of the brave!" The defeat of Caradoc (Caratacus) by the Romans is the subject of Henry Treece's 1952 adult novel, The Dark Island, the second book in his Celtic Tetralogy. As well, a poem titled Caratacus appears in Treece's Exiles, a collection of poetry published in the same year. "Caractacus Seagoon" was the name given to Harry Secombe's Ancient Briton character ("He's up early." "Must be one of the early Britons") in the Goon Show episode, "The Histories of Pliny The Elder". Caractacus briefly appears as a minor character in the Robert Graves novel, Claudius the God. In the television adaptation of Graves's novels, he is portrayed in a brief appearance by Peter Bowles. Caratacus' capture and life as a captive in Rome is told from the point of view of his fictional daughter, Eigon, in Barbara Erskine's time-slip novel, The Warrior's Princess, pub. 2008. Caratacus is a major character in Douglas Jackson's novel Claudius, pub. 2009, the sequel to Caligula (2008). Caradoc (Caratacus) is a major character in author Pauline Gedge's 1978 novel, The Eagle and The Raven. Caratacus appears in several volumes of Simon Scarrow's Eagle series, including Under the Eagle, The Eagle's Conquest, When the Eagle Hunts, The Eagle and the Wolves, The Eagle's Prey, Blood Crows and Brothers In Blood. Caratacus (called Caradoc in the novels) is a main character in Manda Scott's series "Boudica" ("Dreaming the Eagle", "Dreaming the Bull", "Dreaming the Hound", "Dreaming the Serpent-Spear"). ^ Joaquín González Echegaray, The Cantabrians, 1997; Eduardo Peralta Labrador Cantabrians before Rome 2000. ^ The Mabinogion: "Branwen, daughter of Llyr"
^ Richard Williams Morgan (1861). St. Paul in Britain; or, The origin of British as opposed to papal Christianity. pp. 161–. Retrieved 8 August 2012. ^ This article formerly made reference to a passage of Dio Cassius that described Caratacus as a "barbarian Christian". This derived from a transcription error in the version of the Cary translation of Dio online on the Lacus Curtius website, which has now been corrected to read "barbarian chieftain" as per the print edition (Dio 61.33.3c). See also the Foster translation at Project Gutenberg, which also reads "barbarian chieftain". ^ "We are, indeed, told that history has preserved the names of two British females, Claudia and Pomponia Graecina, both of them Christians, and both living in the first century of our era." Lingard, John, History and Antiquities of the Anglo-Saxon Church, 2nd. ed. Newcastle, Walker, 1810 Vol. I., p1. ^ 2 Timothy 4:21 - "Eubulus saluteth thee, and Pudens, and Linus, and Claudia, and all the brethren."